Twitter on Thursday announced a social networking partnership with Apple's Ping music service, making it easier for people to share music discoveries with their friends. Starting Thursday, Twitter and Ping offered friends the ability to put Ping activity, song previews and links to purchase and download music from Apple's iTunes Store in posts made on Twitter.com. Can also link their Twitter account to find Ping users among their Twitter friends. Once the accounts are linked, any "Post," "Like," "Review," or anything else shared on Ping is automatically sent to Twitter followers as well. The content will also include playable song previews and links to purchase and download music through the iTunes Store. Song or album details are also available by clicking a Ping link in Twitter, with information displayed in the details pane on the right side. From the details pane, users can listen to song previews from the iTunes Preview website, right in their browser without launching the iTunes application. 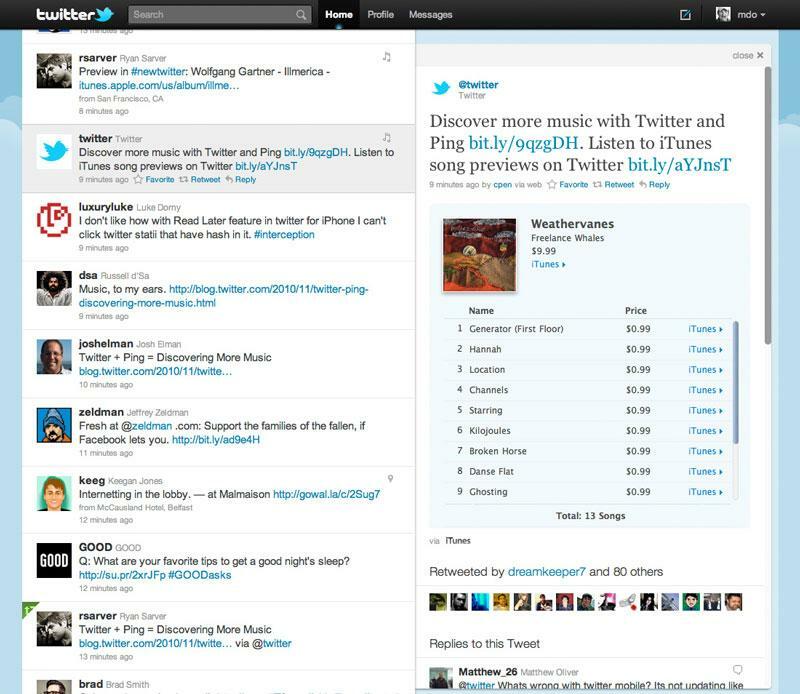 iTunes song previews are available on Twitter.com in all 23 countries where the iTunes Store sells music. The announcement Thursday is a successful marriage between the two social networking services, unlike Apple's apparent falling out with Facebook. Apple and Facebook were said to have been in talks for 18 months to form a partnership for the launch of Ping in September. But those details fell apart at the last minute. Apple Chief Executive Steve Jobs commented on the matter, and said Ping lacked Facebook integration because the website demanded "onerous terms." He indicated that the two parties talked about a variety of partnership opportunities, but could not come to a deal. After talks with Facebook fell apart, Apple included a "Facebook connect" login interface for Ping, without a deal in place. Facebook responded by blocking API access to Ping.